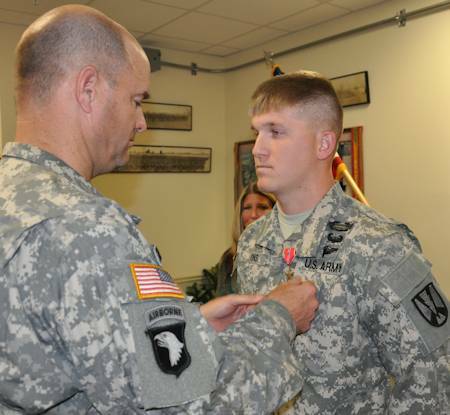 FORT JACKSON, S.C. (Dec. 13, 2012) -- A Fort Jackson Soldier was awarded the Bronze Star Medal for valor last week for his courage and efforts to save the lives of his fellow Soldiers in 2010. Sgt. 1st Class Clint Lyons, a drill sergeant with 1st Battalion, 61st Infantry Regiment, "distinguished himself by valorous actions" Nov. 7, 2010, while serving as a platoon sergeant with the 2nd Brigade Combat Team, 327th Infantry Regiment, in Kunar Valley, Afghanistan, during Operation Bastogne Overwatch XI. "Bastogne Overwatch is basically how we supply our most northern squadron," said Post Command Sgt. Maj. Kevin Benson, during the award presentation at 1-61st headquarters Friday. The mission took 17 hours to make the trip, and took three to four days to complete, he said. "We would have to drive all of our resupplies and fuel up north," said Benson, who was the command sergeant major for the 1st Brigade Combat Team, 327th. "We did those about once a month. I drove on six of them. (Our enemies) would try to intercept that resupply, because they knew that was what we were using to kill them. Lyons said he was told to expect a firefight on the Nov. 7 mission. "It was pretty rough," he said. "We got pinned down for about eight hours by the enemy and had a few casualties." The battalion commander warned them they would be heading into a "hornet's nest," he said. "(Command) was going to let us take the firefight instead of the (supply) vehicles," Lyons said. "'Stand and fight' was the order we were given, so it was expected. We hit the ground and tried to prepare ourselves for what was to come. At daylight, the firefight initiated." The enemy had 70 to 80 heavily armed fighters trying to overrun the platoon's perimeter and take American hostages, according to the award narrative. "Once (Sgt. 1st Class) Lyons felt he had a grasp on the situation at hand, he did the most important thing on the battlefield and informed his higher headquarters in order to bring other assets into the fight," the award narrative reads. "Since radio contact could not be established with the control point, (Sgt. 1st Class) Lyons moved over 100 meters under intense enemy fire in order to inform (command) of the enemy situation." Lyons also provided suppressive fire as a casualty was transported from the scene. "Lyons continued to perform with extreme valor under fire as he coordinated the successful re-establishment of security west of the (hostile landing zone) to a more defensible position," the narrative explains. "Lyons' actions are in keeping with the finest traditions of military service and reflect distinct credit upon himself, the 2-327th Infantry Regiment, the 1st Brigade Combat Team, the 101st Airborne Division (Air Assault), and the United States Army." His family was told Lyons had been involved in combat, but was given no other details about the incident. "We had to wait three days before we knew that he was OK," said his mother, Sharmin Hodge. "After that, we were just waiting to find out what else had happened. But (Clint) was pretty tight lipped about the incident and just let everybody know he was alright." Lyons is a native of Gibsonville, N.C., a town of about 800 people, where he played football for the Eastern Guilford High School Wildcats as a teen. Lyons joined the Army when he was 17 and has served for almost 10 years. "If it wasn't for his platoon, and the other platoons on this same mission, we would have had a lot of Soldiers killed and would not have been able to accomplish our mission up to the north," Benson said. The Bronze Star Medal is the fourth-highest combat decoration and the ninth highest U.S. military award in order of precedence. It can be awarded for acts of heroism and merit, or meritorious service in a combat zone. When awarded for acts of heroism, the medal is awarded with the "V" device. "I think it's great that he was acknowledged for what he did," Hodge said. "I'm proud of him for this. Clint's a great dad and I respect how he's been able to handle himself the way he has since he's got back. That's his greatest achievement, I think."